Nicolas Poussin never painted the moon, I would venture to say. Just like Philippe de Champaigne, he knew how to paint the spiritual in art, but unlike the latter who dared, and successfully so, to represent celestial phenomena, Poussin’s world lies securely on earth ; only and totally on earth : anything under the sun, from the physical blue of the troposphere to the archeological fragments or the animals on the ground, by way of the endless play of light on tree leaves, the strict architectural order, the language of gestures, or the countless paths running through the landscapes ; a dense and complex universe where the appearance of things and beings is more often than not a veil for accessing truths hidden by the beauty of the enigma. This is the reason, despite his public failure in Paris in 1642 or during the crises around 1900 or the zapping fad in 2008, why he is admired, supported by a small group of “devotees” or “heretics”, to use his own terms, and who are happy when confronting (no other word applies, I think) his canvases, his work. 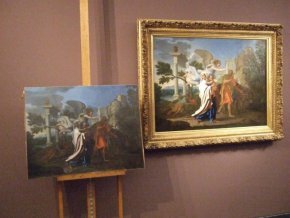 In the same way that in the 1650’s artists like Le Brun, Mignard, amateurs like Loménie de Brienne, collectors like Passart would gather to examine Poussin’s latest arrival at Fouquet’s, Richelieu’s or elsewhere, on 14 May 2008, an enthusiastic group of Poussin “aficionados” assembled at the museum in Lyon, at the invitation of the Musée des beaux-arts of this former Gallic capital and the Musée du Louvre, to discuss the works presented in the exhibition which was organized to mark the acquisition of The Flight into Egypt (ill. 1) belonging to the Lyonnais art dealer, Serisier. We would like to commend Isabelle Dubois, curator for the exhibition in Lyon and the person behind this study day-3, along with Sylvain Laveissière (as well as the generosity of the establishments participating here). The gathering brought together about forty researchers from different geographical (from Denver to Saint Petersburg, including New York, Rome and Frankfurt) and intellectual (from art market to university and also of course museums and CNRS) spectrums. Given the interesting variety of themes suggested by the exhibition (the cycle of Christ the child related to the Flight into Egypt ; the Serisier collection ; Nicolas Poussin in the years between 1655-1657 ; the iconographic sources for the work), the organizers of this study day had chosen to have discussions in front of the works and then read the papers in the auditorium. This method was thus a bit more traditional than the Poussin “scholar day” at the Metropolitan Museum, but an intense (from 9:30 to 19:30…) and stimulating day of work. The openness of the discussions broke down barriers and Pierre Rosenberg, who did not seem at all shocked in 1994 at the idea that the restorer of the self-portrait by Pointel-Serisier from Berlin might have covered up the inscription De lumine et colore (“so hotly debated” ) on the back of the tome that Poussin is holding since it was listed as not being an original (in spite of the engraving by Jean Pesne in 1664 where it is visible), even said that the painting lacked meaning without this inscription. The inscription in golden letters, Nicolaus Poussinus…, also added later, had been kept. Placed above the painting, it probably corresponds to the time when the canvas had been cut off at the top. de Lyon, on the left, the so-called Piasecka-Johnson version. But let us get down to business, the confrontation between the two versions, the Piasecka Johnson which is much smaller (73.5 x 97 cm) and the one from Lyon (97 x 133 cm). Pierre Rosenberg summarized quite nicely the reaction of specialists familiar with both by recalling that during the presentation of the two versions of the Madonna with Staircase, the one in Cleveland and the one in Washington, seeing them side by side was enough for everyone, even the Washington supporters, to admit the obvious. Jacques Thuillier, in his article in 1994, had seen it clearly : “At first glance one discovers the application where the original offered up a vibrant blend of science, tension and chance” . Chance, tension and science which can be seen in the artist’s many repentirs revealing how he placed the line of the hills up higher, redid the Virgin’s veil as well as the architecture and enlarged the figure of Joseph. So, theoretically, there is no problem in establishing the difference, for the post-1640 Poussin, between originals and copies, even those executed at that time . The case becomes a bit more complicated for Poussin works of the 1620’s. 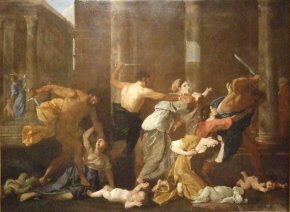 In everyone’s opinion, the Massacre of the Holy Innocents from the Petit Palais, despite large repainted segments, seems to be an original. But fom which date ? Some elements, such as the contours of the faces, with the fine noses, point to 1629-1630, to the Triumph of David in Dulwich but the very sketchy treatment of the architecture can only situate it before Germanicus from 1628 and recalls the first version of the Seizing of the Temple in Jerusalem. So, is there another Poussin who is also Poussin ? In the Dulwich painting, the blue tunic of the ferryman, Charon, has turned colour due to loss of pigmentation, but how much ? Is it possible to find the original harmony of the colours in the first painting ? 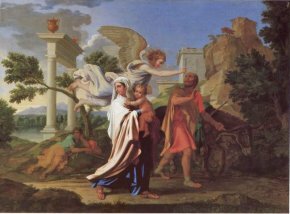 Elisabeth Ravaud, of the Laboratoire de recherches des musées de France, was able to demonstrate that there is indeed a colour repentir in the Flight into Egypt Serisier and that Poussin covered up the turquoise blue tunic of the sleeping youth with “terre de sienne”. Here we have a painter with ties to “disegno” and who, after his stay in Paris, changed his palette to achieve the subtle adjustments in colour which inhabit his compositions after the gray period of the end of the 1630’s : he uses a layer of red, not brown, for the preparation ; avails himself freely of “Naples Yellow”, as in Saint Frances Roman. But another method might make it possible to recover the original colour harmony of some of Poussin’s paintings. This was presented by Jean Penicaut and Pascal Cotte who, at Lumière Technology, has developed a procedure of multispectral digitization, from UV’s to infrareds, at very high definition (240 million pixels). The results are extremely impressive : a painting can be reproduced with absolute precision in the colours, can be seen under an infrared light, and all of this even for details of only one square centimetre . The visible, as well as the invisible, by intense exposure of the painting’s surface, can talk … It goes without saying that the comparison of the two versions of the Flight into Egypt with this method only helped to confirm the impression seen in the morning by the naked eye. But the extent of the precision in the photography is such that it was possible to identify the canvas of the copy, of an uneven and thick weave. This canvas would seem to be Italian, according to Elisabeth Ravaud. This implies that it is a faithful copy, painted by someone in Poussin’s circle in order to keep a version (reproduction would be a better term) of the original in Rome. The visual database presented here opens up new leads for art historians, not only in attributing works, but for entering into the painting process, the act of painting on the canvas. The designers of this system would also like to create a database which would identify colours and thus be able to compare works done the same year, or another decade or by other artists. There is a Faustian aspect to this potentially infinite thesaurus of pixels, and perhaps the multiplying of “scientific” data will not make it possible to really create an absolute reference scale (as was the case for prehistoric gold in the Stuttgart program in the 1950’s). But, for sure, this cognitive computer intelligence will enable us to see beyond reality and grasp what artists wished to dissemble behind their painting process. And also to better apprehend Poussin’s qualities as a great colourist. One of the first tasks might be to investigate the harmony of Poussin’s colours. The invisible can talk, if one uses scientific methods, but in his painting Poussin wanted us to understand what is visible, he the artist who painted with his brain, to use the famous expression by Bernini in speaking of the Phocion landscapes owned by Serisier. And yet the Flight into Egypt remains, despite Isabelle Dubois’ scholarly research, full of the mysteries of revealed religion. Why is there a donkey without reins ? Why is there a Saint Joseph with a lance ? What is meant by the reclining youth in a meditative attitude who, as pointed out by Henry Keazor is that of Diogenes in Raphael’s School of Athens ? Does this reference make any sense in terms of iconography or iconology ? The central point of the picture is the protective gesture of the Virgin’s hand on the Child. But then why is the Virgin turning to the left, that is towards the light and the monumental portico ? 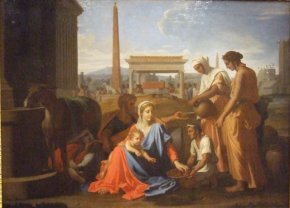 In the case of the Rest During the Flight into Egypt (ill.) painted for Madame de Montmort, Poussin’s letter to Chantelou explains the different Egyptian elements in the painting “to delight by their novelty and variety and to show that the Virgin which is represented here is in Egypt”. Nevertheless, the painting’s true aspect lies well beyond these archeological references and instruction manual : in the humility of the three Egyptians who welcome the Child as a king, as observed by Bellori in his description, or in the message’s religious syncretism, which assimilates, just behind the Holy Family who is taking communion in the form of both the bread and the wine, the cult to Isis and the veneration of the new alliance. But what might have been in the letters between Poussin and Poinel, between Poussin and Serisier ? As pedantic as those between Poussin and Chantelou in which the artist, just like in his self-portrait, poses for posterity and clothes himself in the figure of a wise commander ? Would Poussin have explained the monumental portico from the Flight into Egypt there ? A simple archeological reference meant to delight by its variety and novelty ? A specific monument which alludes to the Nile and symbolizes the entrance into Egypt (making a linear reading of the painting’s composition more complex…) ? Given that the same theme of a door, simplified, also appears in an engraving by Bourdon illustrating the flight into Egypt (also associated with water), is this just a simple motif which embodies the subject of the flight into Egypt and gives it its significance ? In Poussin’s eyes, the meaning of the painting is probably different from Serisier’s and other Parisian amateurs must have interpreted it in even other ways, as contemporary historians do today. Strangely enough, Bernini did not particularly appreciate this masterpiece during his visit to the Serisier collection on 10 August 1665. Perhaps because the composition, due to its austere frieze layout, did not please the Roman artist who still defended, as opposed to Chantelou, the Martyrdom of Saint Erasmus. Bernini’s visit was full of commentaries on Poussin’s art : the Baroque sculptor was awed by the two majestic landscapes of Phocion (“un pittore che lavora di là”, he said pointing to his head) ; saw Raphael in Esther and Assuerus, today at the Hermitage (shown in Lyon) and seemed to doubt the sole hand of Poussin in the Virgin with ten figures . The Musée des beaux-arts de Lyon can now, thanks to the participation of the Musée du Louvre, present in its galleries a work which illustrates the importance of art collectors in Lyon for Poussin in the 1640’s and 1650’s. And this study day proves that, fortunately for art history, there are still many possible fields of research (as well as discoveries) on Poussin, an artist whose depth of work constitutes a joy both for the mind and the eye. Read also by the same author the review of the Poussin day organized in New York by the Metropolitan Museum in April 2008. See the review on this exhibition. It was exhibited at the Musée de la Chapelle de la Visitation in Monaco in 1997 with a bilingual exhibition catalogue (and the show was reviewed in The Art Bulletin, LXXX, 1998-3, p. 569-574). Another version was known to have been circulating on the art market (the Wolf version). 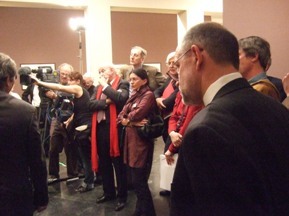 The patrons are warmly acknowledged on the very active  created by the Musée des Beaux-arts de Lyon for the canvas’ acquisition. P. 426 of the Nicolas Poussin exhibition catalogue, (Paris, Galeries Nationales du Grand Palais, 1994-95), Paris, RMN, 1994. Jacques Thuillier, in « Serisier collectionneur et la fuite en Egypte de Poussin », in Revue de l’Art, 1994 ; n°105, p. 33-42, p. 36. Nonetheless, the status of some works is rather ambiguous : Sylvain Laveissière, in his afternoon paper asked out loud if the Landscape with Roman Road (Dulwich), considered to be a copy mainly because it is painted over a Poussin composition, could not in fact be an original. See the site www.lumiere-technology.com and the article that Didier Rykner wrote on them in The Art Tribune. An interesting research subject would be the history of “bad” Poussin works ; those which for some reason an art critic or historian has judged as falling below the level of the master.